Many years ago, I would often have large groups of people over at the house for Shabbes (the Jewish sabbath) or yontiff (Jewish holy days, e.g. Passover, Rosh HaShana, etc). Traditionally for these kinds of get-togethers, you would usually make one form of chicken soup or another. 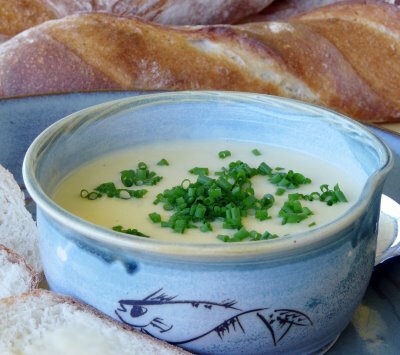 During the fall, winter and spring, I found that I could serve my guests a heart-warming and tummy-pleasing alternative in the form of a creamy (literally or figuratively) Potato Leek Soup. A really neat thing about this recipe, aside from the fact that it is seriously yummy, is that you can very easily adapt it in order to make it milchig (dairy) or fleishig (meat) or pareve (neither dairy nor meat). This is a very serious issue for Orthodox Jews since we are forbidden from cooking, serving, eating etc. any combination or mix of dairy and meat. But by far the coolest thing about this recipe is that it comes with an easy mnemonic regarding the ingredients: 2-4-6-8-10! Allow me to ‘splain’ to you, Lucy. TWO sweet onions; FOUR cloves of garlic; SIX leeks; EIGHT potatoes; TEN cups of chicken broth. Easy! Also needed… butter or pareve margarine, cream (18% or even whipping cream) or pareve non-dairy creamer, chives (fresh or dried). Optional: White pepper, sour cream (see below). I’ll take you through the process. Cut up the onions and potatoes into small pieces. I usually use Yukon Gold potatoes or sometimes white potatoes for this recipe but you can use whatever potato you feel would be good in a soup. CAREFULLY clean the leeks. Once cleaned, slice the leeks relatively thinly, again keeping in mind that everything is going into the food processor. Heat some butter (if it is going to be a milchig dish) or pareve  margarine (if it’s going to be a pareve or fleishig dish) in the bottom of a LARGE soup pot. Don’t be stingy with the butter/margarine. There are a lot of vegetables in this dish and you want them to cook properly. I use a few heaping tablespoons. Sauté the garlic, onions and leeks until they soften. Add potatoes and sauté a bit more. Don’t worry about the potatoes not softening at this stage. You want only to give them a bit of a head start. They will fully cook in the chicken broth. Add chicken broth. Again, if it is a milchig dish, use one of those pareve chicken powder mixes (e.g. Osem brand). If it is going to be a fleishig dish, you can use either the pareve chicken broth mix or actual chicken broth or stock. Cook, stirring occasionally, until potatoes are done. Let cool until it’s warm, not hot. Don’t put boiling hot soup into a food processor. Trust me on this one. 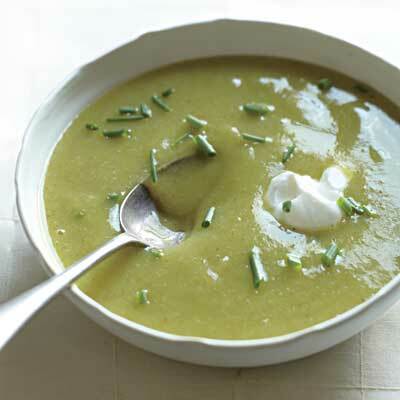 In batches, run soup through food processor until it is creamy smooth. Return to pot and reheat stirring frequently but not to the boiling point as you don’t want the bottom to burn. 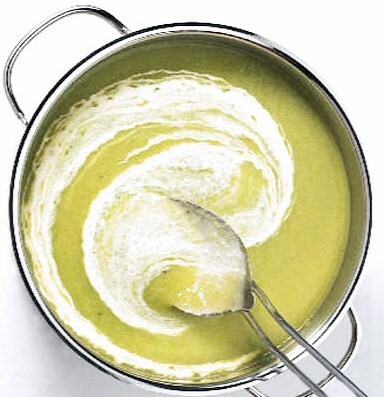 To serve, ladle soup into bowls and, if you like, swirl in a bit of cream/creamer  to make a nice pattern. Sprinkle with fresh chives. If you are using dry chives, add them directly into the pot a few minutes before pouring into bowls. If you prefer, instead of swirling in the cream, you can add a dollop of sour cream, if you’re going milchig! Some people like adding in a bit of white pepper to the recipe or just onto the soup once it’s in the bowl. With this relatively simple dish, you get an enormous bang for your buck. People will think you are an amazing cook when all you did, when it comes down to it, is cook some veggies in chicken broth and run it through a food processor. Not bad, eh? Oh, by the way… here’s a tip. If you want the soup to be thicker, reverse the 8-10 ratio to 8 cups broth and 10 potatoes. It also freezes very well, which is great because really excellent leeks are not always available year-round. You can make a ton of this stuff when the leeks are at their best and freeze it for months. When you want to use the frozen soup, though, put it in the fridge the night before and let it thaw a bit overnight. When you put the soup in the pot, set the heat very low. You don’t want to burn it by using too high a setting. Stir frequently. While I myself don’t own a microwave, if you have one, I expect that thawing the frozen soup in the microwave should be OK. I hope you have as much fun making and serving this dish as I did! There’s nothing quite like the satisfied look on your guests’ faces when they enjoy your cooking. Special thanks to my friend Mozes Yehudaioff for encouraging me to write down and post this recipe. I am sure between him, being Bukharian, and the amazing Steven Burke (from Hungarian hasidishe blood), they could polish off a pot of this soup over a Shabbes. Everything is going into a food processor later. Don’t make the pieces too big, especially the potatoes, or else they won’t cook all the way through and they’ll give you a hard time when it comes to blending them in the food processor. This is also of special concern to Orthodox Jews since all kinds of nasty things can get caught deep in the layers within the leeks. I get rid of the dark green leafy stuff at the top and keep the good stuff by cutting just about the place where it turns from dark green to lighter green, just above the white base. I cut the leek in half lengthways starting an inch or so above the root end, then spread all the layers open and wash deep into the crevasses. Be careful: Many items that are labelled ‘non-dairy’ actually do have small amounts of dairy products in them. Make sure the label specifically says ‘pareve’. When it comes to pareve margarine, Fleishman’s margarine (in the small tubs with the blue stripes) is what I use. Rich’s non-dairy creamer is the only thing I’ve ever used but I find it more ‘milky’ than ‘creamy’. If you find something that is pareve and closer to a proper cream taste and consistency, by all means give it a go!